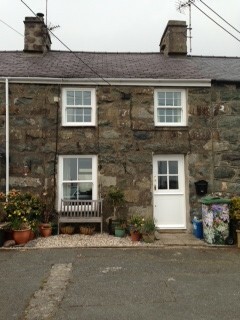 The 19th Century Cottage is in the heart of Criccieth on The Maes. It has amazing views across the Tremadog Bay to Harlech and to Criccieth’s castle, parts of which date back to 1239. In the summer you can’t beat a good glass of wine with friends sat out side looking at the view. It sleeps up to 5 with two double beds and one single. There is pull out single bed if really needed. Recently renovated with slate floor downstairs and original floorboards upstairs, it is well appointed and has a fully equipped kitchen with microwave and washer drier. The living room has an Inglenook fireplace with a wood/coal burning stove. There is also central heating. Bed Linen is provided and gas and electricity are included. There is a TV, DVD, CD system and iPod docking system and radios in the bedrooms. There are a wide range of maps books and DVD’s for making the most of your time in the area. At the back of the cottage is a private patio area with a BBQ, picnic bench, chairs and sun loungers.